A wooden sculpture in an open field. 1. 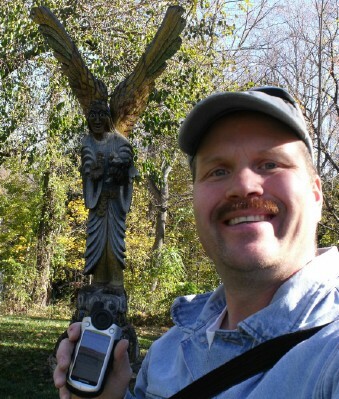 Please post a photo of yourself and/or GPS with the sculpure. If you are particularly camera shy, a photo of just your GPS and the sculpture would be acceptable. 2. The Log Password is the first four words (lower case, no spaces) you will find at the feet of the angel. 3. In order to log a find, you need to have visited the spot indicated. You will need to cross a flat grass field, but otherwise should be handicap accessible. May be difficult for wheelchairs, depending on conditions. There is a TerraCaching virtual (Temporary Stay - TC2MX) and a Waymark (August 26, 1814 - WMEEH) also located on the site. I drove by the cache site yesterday and noticed the angel was gone! I did some research and noticed that the sculpture is in the process of being repaired. I will try to monitor the situation and re-enable the cache, once it is back in place. I've been meaning to get over here for some time. I finally made up my mind to come out to see this. A very nice sculpture, if not a little creepy. This is now an OCUS ONLY cache. I have retired the original Navicache listing.